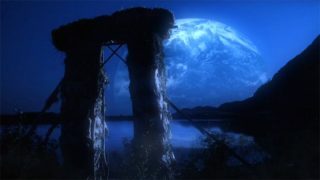 After Teal'c and Vala vanish during Baal's execution ceremony, the team gates back to Earth to discover that the timeline has been altered and the Stargate program no longer exists. Sam, Cameron, and Daniel are settled in three different parts of the United States in order to keep them away from one another — though it’s not exactly clear where they are living. Sam is transported in a vehicle marked “McChord A.F.B.,” which would put her in Washington State. Cameron’s taxi is marked “Heartland Taxi,” likely putting him the Midwest (and within driving distance of his childhood home). That would likely put Daniel in a city on the eastern seaboard, though there don’t seem to be any hints at just where he lives. Allowing Cam to live in or near his childhood home town would not have been much of a security threat from the military’s point of view. Since Cam was never born in this timeline, he has no doppelganger that might cause someone to recognize him. The cast of Stargate: Continuum headed north to film scenes for the movie in the Arctic. Ben Browder, Amanda Tapping, and Richard Dean Anderson shot in the sub-zero climate at the U.S. Navy’s Applied Physics Laboratory Ice Station (APLIS) from March 23 to 29, 2007. The station — a joint venture between the University of Washington and the U.S. Navy — is located approximately 200 nautical miles north of Prudhoe Bay, Alaska. The cast and 18-person crew (which included director Martin Wood, director of photography Peter F. Woeste, executive producer N. John Smith, props master “Evil” Kenny Gibbs, DVD special features producer Ivon Bartok, and others) filmed the movie’s walk-and-talk shots on the Arctic ice flow, the surfacing of the U.S.S. Alexandria, and on board the Los Angeles class submarine on loan from the Navy. Even the vessel’s real Captain and crew got in on the action, and were incorporated into the film. The entire trip was made possible by A.P.L.I.S. commander Barry Campbell — himself a big fan of Stargate — who approached Wood, Smith, and Stargate director Andy Mikita while they were signing autographs at the Vancouver Stargate convention in 2005. Campbell appears on screen in the movie, welcoming O’Neill and the others on board the submarine immediately after it surfaces. Not to be outdone by the Navy, the U.S. Air Force (which has had a long-standing relationship with the television series) delivered a pair of F-15 fighter jets (from the 173rd Operations Group out of Klamath Falls, Oregon) to be used in the movie. Browder, Tapping, and Shanks were joined in the cockpit for two days by executive producer and Continuum writer Brad Wright, who describes himself as a “jet whore.” Wright thus appears in the film (as the pilot of Daniel’s plane), and even has a few lines of dialogue over the radio. Watch this special Continuum video feature produced by the Air Force! 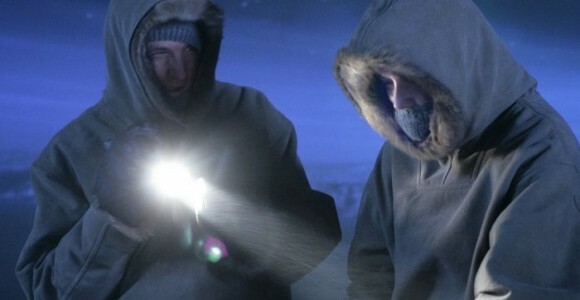 Following the 5-day Arctic shoot, principal photography for Stargate: Continuum began in June, 2007. The film shot for another 19 days at The Bridge Studios (where Stargate SG-1 had filmed for 10 years) in Vancouver, British Columbia. This included freezing a sound stage, both for the frozen cargo hold of the Achilles and the external Arctic scenes with Cameron, Sam, and Daniel. Actor Michael Shanks was unable to travel to the Arctic with his co-stars, as he was filming a guest stint on the hit series 24. “Right now, we know for sure that the main cast of Season Ten will be returning: Ben Browder, Michael Shanks, Chris Judge, Claudia Black, and Amanda Tapping. Beyond that, we are still working on it. I know that Brad’s put a call into Richard Dean Anderson. … We’re hopeful he’ll make an appearance, whether he’s in both [movies] or just one. We’re not sure yet. “Continuum is more like Stargate of old than it is going forward. It’s a good ‘ole Stargate story made as big as possible. And that, in part, is because Rick is in it. But it’s also because it’s a time-travel story. Therefore I was able to bring back a lot of very familiar faces who’ve been gone for some time. “The timeline has been changed at the end of Continuum in a subtle, but permanent way. And that is actually illustrated in the final frame of the picture. You’ll see. It’s cool. Keep in mind, too, in this time travel story, what makes this subtly different than other stories we’ve done is these guys remember the old timeline. That’s what makes Continuum different. That’s what makes it the time-travel story I wanted to do. “As the movie unfolds, and as Baal’s plan unfolds, we try to get back to Earth — and, granted, it’s a conceit of mine that traveling through the wormhole keeps them immune from the effects of the timeline [changing]. “… There’s hundreds of shots. Hundreds of visual effects shots in both movies. I have a sequence over the Atlantic with F-15s and Goa’uld death gliders. That’s just one of the many visual effects. I have a freighter in the ocean crossing the Atlantic that is a visual effect. I have a lot of visual effects, and it’s going to take a significant amount of time to finish them. Stargate: Continuum marks the final appearance in the franchise for actor Don S. Davis (General Hammond). Hammond served as the commander of Stargate Command through SG-1‘s seventh season, when Davis left the show due to health concerns. He reprised his role in both SG-1 and Stargate Atlantis on several occasions. Davis passed away on June 29, 2008. “Continuum is done. It was shot at the same time and then delayed in its post-production until ‘Ark’ was finished, and Brad’s finished it off, now. … I know it will be coming out at the end of July to coincide with Comic-Con. “That was one of the most exciting experiences I’ve ever had. Aside from giving birth and being a parent, going up to the Arctic ranks right up there in my top 10 life experiences. It was a challenge and an adventure. We were a small group of wacky and intrepid explorers and it was a total team effort. Everyone helped out with everything. Brenda [Turner] from the hair department came up with us and did hair, make-up and wardrobe. Kenny [Gibbs] from props busted his hump and was acting like an AD [assistant director]. At the end of each day we’d go to the hooch, which were these plywood sheds we lived in, to see who needed help with whatever. It was just a really amazing group of people, and by the very nature of what had to be done, it had to be a small group, so things worked out great. “There’s this one scene we did which was a huge helicopter shot with me and Ben walking. We had to get far away from camp and from everyone, so they plopped us in snowmobiles, dumped us off and said, ‘Start walking.’ The helicopter then came buzzing overhead, and as we were walking we thought to ourselves, ‘Man, no one ever walked here before, and no one will probably walk here again. How many actors get an opportunity like this,’ and how many actors given this opportunity would take it? They could have easily used stand-ins or photo-doubles because it’s a helicopter shot of two very tiny figures dressed in full Arctic gear, but, gosh, I wouldn’t have traded that experience for anything. VOTE! How would you rate "Stargate: Continuum?" Win Tickets To The ‘Gateway’ Stargate Convention In Chicago! Byron Miller on Win Tickets To The 'Gateway' Stargate Convention…Super excited to go!